The analysis of job skills and preparation in this report is based on the U.S. Department of Labor’s Occupational Information Network (O*NET), a database covering more than 950 occupations. Each occupation is rated on a series of dimensions, including the importance of various skills and the level of preparation needed to perform the job. 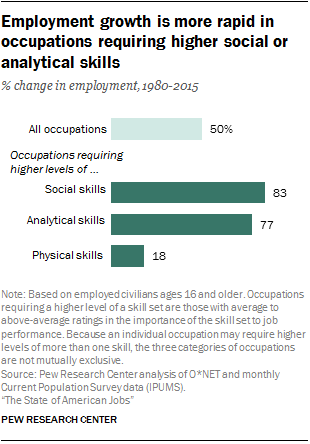 Many occupations have overlapping skill requirements (e.g., it is important for postsecondary teachers to have higher levels of both social and analytical skills). The analysis also uses O*NET data to examine the changing need for job preparation in the workplace. The level of preparation reflects the combination of education, experience and other forms of training needed on the job. Occupations were rated as requiring either an average to above-average level of preparation or a below-average level of preparation. The average level of preparation corresponds to an associate degree or a similar level of vocational training, plus some prior job experience and one or two years of either formal or informal on-the-job training (e.g., electricians). When workers are asked about the skills they rely on most in their jobs, interpersonal skills, critical thinking, and good written and spoken communications skills top the list.4 While most Americans say having a detailed understanding of computer technology is very important for success in today’s economy, only 28% say computer skills are central to the work they do, and even fewer (14%) say they rely on high-level math, analytical or computer skills at work. For those who rely on critical thinking skills, the workplace is an important training ground. Among workers who say this skill set is important in their job, 46% say they learned these skills on the job. About one-in-five (19%) say they acquired these skills in their formal education, and a similar share (18%) say they gained these skills through life experience. Workers are more divided when it comes to where they learned written and spoken communications skills: 42% say they picked up these skills through their formal education, while 30% say they learned these skills through work experience. An additional 12% say they learned these skills through life experience or that they were self-taught. The earnings of American workers have increased modestly in recent decades. According to the Center’s analysis of government data, the average hourly wage, adjusted for inflation, increased from $19 in 1990 to $22 in 2015, or 16% in 25 years.6 Jobs requiring higher levels of social or analytical skills generally pay more than jobs requiring higher physical or manual skills, and the pay gap between manual and analytical jobs has grown over the years. The average hourly wage of workers in jobs requiring higher levels of analytical skills increased from $23 in 1990 to $27 in 2015, or 19%. And the average wages of workers in jobs requiring higher levels of social skills increased from $22 to $26 over that time period (15%). In the meantime, the average hourly wage of workers in jobs in which physical skills are important increased only 7%, from $16 in 1990 to $18 in 2015. The survey finds that pluralities of Americans feel that employer benefits are not as generous as they were in the past (49% say that) and that they will continue to worsen in the future (44%). They are right about the direction benefits have been going. According to government data, the share of workers with an employer-sponsored health insurance plan (either through their own employer or through the employer of a family member) fell from 77% in 1980 to 69% in 2013. In addition, the share of workers with access to an employer-sponsored retirement plan has fallen. It most recently peaked at 57% in 2001, up from 50% in 1980.7 However, the share fell to 45% by 2015. There are somewhat paradoxical findings in the survey when it comes to issues related to job security. On the one hand, American workers’ confidence in their own job security is relatively high these days, especially compared with the low point in the early 1980s. On the other hand, people believe there is less job security overall now than in the past, and that more job insecurity awaits tomorrow’s workers. Today, 60% of employed Americans say it is not at all likely that they will lose their job or be laid off in the next 12 months. An additional 28% say it is not too likely. By comparison, in the midst of the 2001 recession, 52% believed it was not at all likely they would be laid off. Overall, 49% of American workers say they are very satisfied with their current job. Three-in-ten are somewhat satisfied, and the remainder say they are somewhat dissatisfied (9%) or very dissatisfied (6%). The most satisfied workers tend to live in higher-income families and have higher levels of education. Still, the survey identifies vulnerable workers. Those with lower levels of education are more likely to be temporary workers or out of work altogether. They are also more likely to believe their current skills are insufficient for career advancement and to think there are not enough good jobs locally. Furthermore, less educated workers are also among the most likely to say that their jobs are imperiled. For instance, 39% of those without a high school education say it is very or fairly likely they may be laid off within 12 months. By comparison, 7% of those with a bachelor’s degree or more education say the same. Educational attainment is a clear and consistent marker when it comes to feelings about job security and future prospects. One-in-five (20%) of those with a high school diploma or less believe it would be possible for their boss to use technology to replace them – nearly double the rate of those with a bachelor’s degree who say that. Roughly four-in-ten (38%) workers with no college experience say they lack the education and training to get ahead in their jobs, compared with 27% of those with a bachelor’s degree who assert that. More broadly, and despite the views of many that their current jobs are safe, a sizable number view the national job situation as unstable at best. A majority of Americans (63%) believe jobs are less secure now than they were 20 to 30 years ago, and about half (51%) anticipate jobs will become less secure in the future. As they assess the factors that may be hurting U.S. workers, people say the greatest harms to American jobs are outsourcing (80% believe outsourcing hurts American workers) and imports (77%). Many also cite the increased use of contract and temporary workers (57%) and the decline of union membership (49%) as harmful factors. The impact of immigrants and automation draw more evenly divided verdicts. Half of Americans (50%) think automation of jobs has hurt workers, compared with 42% who think it has helped. Some 45% of Americans believe the growing number of immigrants working in the U.S. has hurt workers overall, and 42% believe the immigrant influx has helped workers. There has been a substantial increase since 2006 in the share of Americans, especially among Democrats, who believe the influx of immigrant workers has helped U.S. workers overall. What’s mostly helping workers? Big majorities think exports and work-enhancing technology such as the internet and email are aids to workers. Americans think the responsibility for preparing and succeeding in today’s workforce starts with individuals themselves: 72% say “a lot” of responsibility should fall on individuals, and 22% say “some” responsibility is theirs. Six-in-ten believe public K-12 schools should have a lot of responsibility, while 28% believe schools should bear some responsibility. After that, views differ on the roles other entities should play, including some ambivalence about the purpose of colleges and universities. Among all adults, 52% say colleges should have a lot of responsibility in making sure that the American workforce has the right skills and education to be successful, and 49% believe employers should have a lot of responsibility. After that, 40% assign a lot of responsibility to state governments, and 35% say the federal government should assume a lot of responsibility. Notably, people’s views are linked to their partisan allegiances. Democrats and independents who lean Democratic are more likely than Republicans and Republican leaners to say public schools, colleges, and the federal and state governments should have a lot of responsibility for making sure U.S. workers are prepared for today’s jobs. Republicans and Republican leaners place more emphasis on individual responsibility. Americans have somewhat mixed attitudes about the effectiveness of traditional four-year colleges and other higher education institutions. On a personal level, many college graduates describe their own educational experience as having a generally positive impact on their personal and professional development. Around six-in-ten (62%) college graduates with a two-year or four-year degree think their degree was very useful for helping them grow personally and intellectually, while roughly half think it was very useful for opening up job opportunities (53%), or for providing them with specific job-related skills and knowledge (49%). Yet even as many college graduates view their own educational experience in positive terms, the public as a whole – including a substantial share of college graduates – expresses reservations about the ability of higher education institutions to prepare students for the workforce more generally. Just 16% of Americans think that a four-year degree prepares students very well for a well-paying job in today’s economy. An additional 51% say colleges prepare students somewhat well for the workplace. The verdict on two-year colleges is similar: 12% think that a two-year associate degree prepares students very well, and 46% say this type of degree prepares students somewhat well. When it comes to professional or technical certificates, 26% of adults say these prepare students very well for well-paying jobs and 52% say somewhat well. These findings tie to previous Pew Research Center work showing that noteworthy majorities of adults think colleges fail to provide students with good value for the money and that college is too expensive. Relatively positive assessments of certificate programs as a way to prepare workers for jobs in today’s economy are particularly widespread among those who did not complete high school; 44% in this group say these types of programs prepare people very well, compared with about a quarter (27%) of those with a high school diploma and a similar share of those with some college (22%), a two-year degree (28%), or a four-year degree or more (22%). Workers have mixed views on the extent to which their own credentials and qualifications match up with the requirements of their job. Some 41% say they have more qualifications than their job requires, compared with 50% who think they have the right amount of qualifications and 9% who say they are underqualified. In addition, working Americans were asked if they thought someone with less education than they had could develop the skills and knowledge needed to do their job. A solid majority (73%) say “yes.” Among those with a bachelor’s degree, 65% say someone with less education could learn to do their job, and the shares are significantly higher among those with some college (82%) and those with a high school diploma (80%). Even so, job seekers take minimum requirements seriously. A third of those who do not have a four-year college degree have elected not to apply for a job they felt they were qualified for because it required a four-year degree, suggesting that employers may be missing out on a pool of potential workers. These findings about the state of work in America emerge in the midst of a national political campaign where voters think the economy is a top concern. A separate Pew Research Center survey, conducted Sept. 1 to 4, 2016, among 1,004 adults nationwide, focused on major issues in the campaign. Offered a list of five key issues and asked which one is the most important to their vote for president, 37% of registered voters cite the economy, 18% choose health care, 14% say terrorism, 13% name immigration and 13% name gun policy. Asked further about a series of economic concerns, 43% of voters say the job situation is either the most important economic issue in determining their vote for president this year or the second most important. The same share say the federal budget deficit is either first or second among the factors driving their vote for president. An additional 38% of voters point to tax reform as the most or second-most important economic issue influencing their vote for president, 32% cite income inequality, 22% say rising prices and 16% cite global trade. Among registered voters, Republicans (43%) and Democrats (48%) are roughly equally likely to cite jobs as the first or second key economic issue driving their vote for president. They differ, however, in the importance of the budget deficit – Republicans are three times as likely as Democrats to rank this as a top issue (62% vs. 20%). Among independents, 50% place high importance on the deficit. Republican voters also place more importance on tax reform than do Democrats (44% vs. 31% say it’s the most or second-most important issue). Democratic voters place much more importance on income inequality than do Republicans: 54% vs. 12%, respectively, rank this issue as the most or second-most important economic issue for them. Democrats are also more likely than Republicans to say rising prices are an important voting issue (26% vs. 16%). There is no significant gap between Democrats and Republicans when it comes to the importance of global trade. The remainder of this report examines in greater detail key trends in the labor market and how they are playing out in the lives of American workers. Chapter 1 includes an analysis of trends in job and wage growth by occupations with an emphasis on skills and preparation. It also looks at trends in employer-provided benefits, job tenure, hiring practices and alternative work arrangements. Chapter 2 looks at public assessments of the job situation – including how key characteristics of work have changed from a generation ago and what the future may look like, the extent to which megatrends in the economy are helping or hurting today’s workers, who bears the greatest responsibility for worker readiness these days, and which skills are most important in today’s economy. Chapter 3 explores the views of workers themselves including job satisfaction and fulfillment and feelings about job security. Chapter 4 looks at the skills workers use in their own jobs, whether they feel properly equipped to do their jobs well, and where they would turn to increase their skills and gain additional training. And finally, Chapter 5 explores public views about the value of a college education. In 2015, one-in-four workers (25%) in the U.S. had a job-related certificate or license, such as an information technology certificate or a teacher’s license, according to new data from the U.S. Bureau of Labor Statistics. The share is higher among better educated workers, running at 52% among workers with a postgraduate degree. Women (28%) are more likely than men (23%) to have a certificate or license. Americans are putting in more time at work. The average length of a workweek was 38.7 hours in 2015, slightly up from 38.1 hours in 1980.8 Meanwhile, Americans are working more weeks per year. The average weeks worked per year increased from 43 in 1980 to 46.8 in 2015. Combined, this adds up to an additional one month’s worth of work in a year. Job tenure has ticked upwards. In 2014, about half of workers (51%) had worked for their current employer five years or more, compared with 46% of workers who were in that position in 1996. Workers are increasingly taking on a variety of nontraditional jobs: Some work as independent contractors, some are employed through a contract firm and others are on-call workers or serve as temporary help through an agency. According to experts,9 the share of U.S. workers with these alternative employment arrangements has gone up significantly in this century. It’s estimated that in 2015, 15.8% of the U.S. workforce, or 24 million workers, is in these types of jobs. In data based on the Current Population Survey, “employed” Americans are those who were at work in the week prior to the survey or who were temporarily absent from their job. In data based on the Current Employment Statistics survey, “employed” Americans are those who are on non-farm payrolls who received pay for any part of the pay period that includes the 12th day of the month, including those on paid leave. Persons are counted in each job they hold. In data from the Pew Research Center surveys, “employed” Americans are those who say they work full or part time, unless otherwise noted. “In the labor force” is used to describe those who are either employed or are unemployed but are looking for work. Employed respondents were asked how many jobs they have. If they said they have more than one, they were asked if they consider one to be their primary job. Respondents who reported having more than one job and don’t consider one to be their primary job were not asked most subsequent questions about their current job. Those who said they have more than one but consider one to be their primary job were asked to think about only their primary job when answering questions about their current job. See topline questionnaire for details on how each question was filtered. Throughout this report, “four-year degree” and “bachelor’s degree” are used interchangeably. Similarly, “a bachelor’s degree or more” and “at least a bachelor’s degree” convey the same level of educational attainment. Unless otherwise noted, “some college” includes those with a two-year degree or those who have attended college but did not complete a degree. “High school” refers to those who have attained a high school diploma or its equivalent, such as a General Education Development (GED) certificate. References to whites, blacks and Asians include only those who are non-Hispanic, unless otherwise noted, and identify themselves as only one race. Hispanics are of any race. In Chapters 2 to 5, Asians are not analyzed separately due to small sample size.